There is a kiva at RedCliff Ascent. The kiva is an invaluable sacred space we use for ceremonies. Traditionally, a kiva is a ceremonial structure build by natives of the southwest. 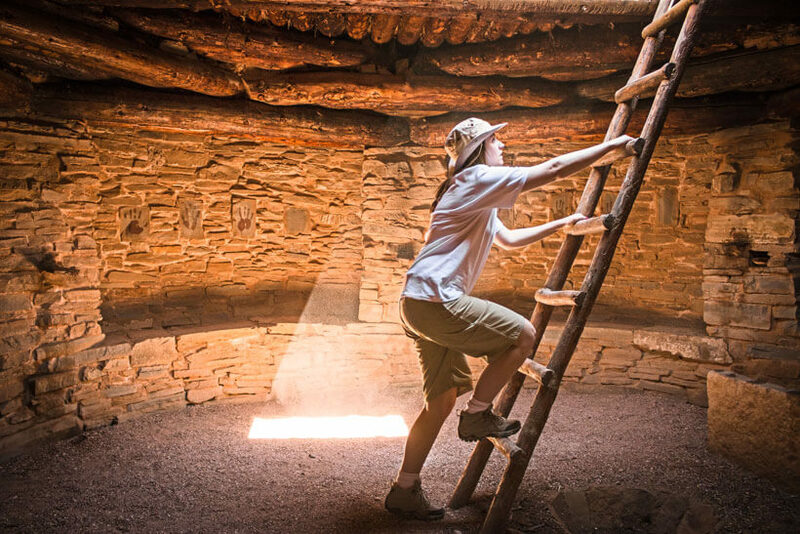 The Chaco Canyon or Mesa Verde ruins are home to some of the most well-preserved kivas. They are often referred to as a "keyhole kiva". This is in reference to the shape if looking down on a kiva with no roof. Most of the time, the chamber or "ante-chamber" is located to the south of the main circle of the kiva so from the satellite view, the top of the keyhole would be to the north and the bottom to the south. We purchased a piece of property in 2002 located in the south-central part of our field of operation. There were many different ideas about how to develop the property. We knew we wanted to use the Outpost, as it was called, to strengthen RedCliff programmatically. We wanted a location where groups could come to get fresh water, shower, do a service project, and learn primitive skills. In addition, we wanted a secure structure to help logistically to reduce response time in the field. It appeared that Outpost was going to meet all of those requirements and more for us. Outpost would also serve as a permanent graduation camp. Up to this time, we had been holding multi-day graduation activities in different locations around our field. This required a great deal of set up and take down, including strenuous tasks such as hauling water. With a stationary graduation camp which included water and sanitation facilities, it made life much more manageable. We were able to focus more on serving families and managing the reunion process. It was during the development of the Outpost property that I visited a friend, John Olsen, and saw his kiva. John was an instructor for primitive skills for many years. He took me out to show me his latest project. He was in the process of constructing a kiva on his property in Apple Valley, Utah. John had shoveled out a hole that was roughly 12 feet across and about 8 feet deep, by hand. Then he began to stack large rocks against the perimeter of the hole and backfill behind the rocks as he went up. The result was an impressive round, stone room with stone benches about 2 feet high all the way around the room. The benches were separated only by six columns reaching the full height of the wall. These columns later supported log beams. The beams became the foundation for the roof. The roof looked like an upside-down basket. Everything was then covered with earth and restored to its natural ground cover. So, when people approached the kiva, the only thing visible was the ladder protruding from a rectangular hole centered in a slight mound. The kiva made a strong impression on me. A few of my kids and I even lent John a hand in chinking the cracks between the stones with clay. This began a thought process for me which involved building our own kiva at Outpost. In our line of work we often hear the term "hold (or create) a sacred space". Typically, people use this phrase to mean creating an emotionally safe area, generally by asking the people in the area, room or space of some kind, to be focused and considerate to others feelings. This allows the group occupying the space to engage in sincere dialogue without a threat of retaliation or inconsiderate feedback. For us, the kiva is not some theoretical, ethereal cosmic space but a real place. Before the kiva was complete, I experienced something sacred in it. One evening in the summer of 2003 as I sat alone in the kiva hole on the stone bench. The walls were unfinished. They were only two-thirds complete. Rocks lay scattered on the floor at my feet. A Coleman lantern glowed off to my left and the room was still open to the cloudless night sky. As I leaned back to rest my tired back and look at the stars, there came to my soul a peace and contentment that was very special to me at that time. 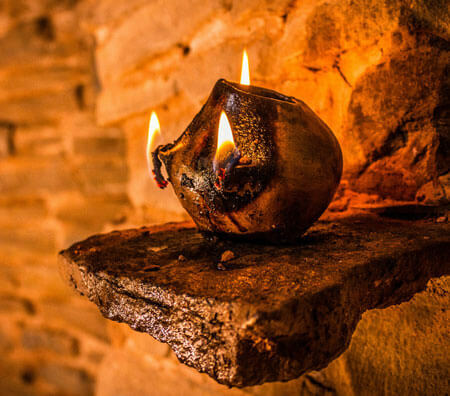 The kiva is a sacred place where people can find emotional safety. A place where the sunlight reflects off earth and stone to create a soft warm haven. A place where we feel and express gratitude for the things that make us better, stronger, more alive and more connected.